Ahhhh, another Stephen King movie. These just aren’t made in the same abundance as they used to be. His stories seem to be relegated mostly to TV miniseries and the occasional anthology television series episode, these days. King has tried his hand at pretty much every subgenre of horror there is, but it’s his ghost stories that have entertained me the most. As I’ve mentioned elsewhere on this site, haunted house films are one of my favorite horror subgenres, so naturally a movie about a haunted hotel room based on a story by Stephen King was bound to tickle my fancy. “1408” shares several similarities with other haunted house stories written by King, with more than a passing resemblance to “The Shining” and “Rose Red”. 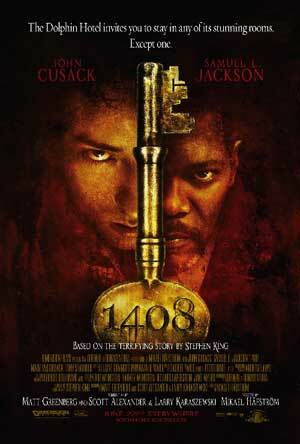 Like the aforementioned examples, “1408” is a more surreal take on the subgenre and is all the better for it. Mike Enslin (John Cusack) is the skeptical author of a series of haunted hotel guides. He receives a mysterious postcard in the mail from the Dolphin Hotel in Manhattan, urging him not to stay in room 1408. Taking the warning as a challenge, Mike forces the hotel’s manager (Samuel L. Jackson) to let him spend the night in the supposedly evil room. Since the hotel’s construction, there have been fifty-six recorded deaths in the room, though Mike is not spooked. However, shortly after checking in, room 1408 begins to play tricks with Mike’s head. And as Mike quickly discovers, checking out of room 1408 is impossible. One thing I’ve noticed about King’s haunted house stories is that he likes to portray the house (or the room, in this case) as its own character. A lot of haunted house stories simply pit the main cast against the spirits dwelling within the location, but King goes a step further and presents the actual place as a sentient villain. I’ve always dug that approach as it adds a certain level of dread to the conflict. When you enter these places you’re essentially entering another dimension, where the house or hotel room dictates the laws of reality. This paves the way for some pretty heavy surrealist horror tactics, most of which hit the mark. Room 1408 draws on Mike’s memories, dredging up his most painful experiences in a sick attempt to force him to commit suicide. Mike has to weather these bizarre challenges as they get increasingly worse. The scares range from your standard “jump” scares to some of the more unnerving “what the hell” variety. I’m usually very critical of “jump” scares, as I find them to be lazy and cheap for the most part, typically only relying on the volume level of a theater’s sound system to provide an effective fright. The “jump” scares in “1408” are markedly better than those featured in lesser horror films, coming at you with little warning yet placed at the most opportune and appropriate moments so they don’t feel quite so cheap. The more surrealist horror elements were my favorites, though. When Mike becomes trapped in the room he literally becomes isolated from the rest of the universe, with unique and disturbing barriers keeping him from escaping or calling for help. A few of the ideas seemed to be recycled from “Rose Red” (which had a very similar concept of a haunted house isolating the cast from the rest of reality), but they comprise only a small number of the scares. Since the bulk of the movie is just John Cusack being flooded with violent supernatural blows to his sanity, it of course falls on his shoulders to carry the movie. John Cusack isn’t one of my all-time favorite actors, but he’s still a very good one and is more than up to the task. He occasionally expresses a bit too much humor after some of the more frightening sequences, which I felt broke the tension a bit too much. Then there’s Samuel L. Jackson as Gerald Olin, the hotel manager. His role isn’t very big, but he plays it with his usual presence of charm and humor. You won’t leave the theater squealing “Wow, Samuel L. Jackson sure was FANTASTIC in this movie!” but you won’t be disappointed in his performance, either. Lately, the haunted house subgenre of horror has been in a rather sad state of disrepair, what with the only other one of note released this year being the underwhelming “The Messengers”. “1408” is a refreshingly good return to the genre, based on a story written by a man who knows how to write a good haunted house tale. With this month being tragically low on horror flicks, “1408” is definitely your best bet. I think I should watch this movie. Most of the reviews that I’ve read about this movie is good and worth watching. No way.. very disappointed with this movie. An effort, which starts so well, goes in vein in the last 1 hour. You will love it till the time Krusack enters the room and then the first 10min in the room. Then after you feel like something is coming now..now..ok now… okkay now…..okhayyyy noww….. but nothing spine chilly happens.After the movie all u remember is Krusack’s performance. He has raised beyond the worthless script. On a scale of 10 full 5 to Krusack and 1 of 5 to the chill/thrills. Hence overall rating 6. If u wanna enjoy your weeked night…get a DVD of House on Haunted Hills again. under no circumstances watch this film. I have never posted on a forum of any kind in my life, until now. My feelings are so strong that no one should pay any amount of money to waste an hour and a half of their life to watch such poorly produced, story lacking, uninspired dross that i am now making a lifetime first. Really, i enjoy testing others opinions by watching films that have received less than favorable reviews, but in this case i wish i had listened to Samuel L Jackson and not entered the room. DON’T DO IT. STEP AWAY FROM THE DVD PLAYER. GO FOR A WALK. I have not seen it yet but I’m going to tomorrow, my girlfriend was telling me about it. I’ve seen the film, and it’s very, very good in my opinion. I watched dozens of gory movies with only pop-ups and blood everywhere, and I’m not saying they’re bad, but I eventually got sick of them. This is very refreshing. Being forced to relive an hour of excruciating pain, but that pain is not physical- it is mental, in my opinion the far more worst one. You can not leave, you can not ever check out, unless you use the ”express” way- suicide. Clever movie, with much twists, unexpected mindf**cks and for a time I had thought he got away. As Olin said, ”That is one evil f**cking room”.